- Excellent dimmer for 12V/24V Incandescent/Halogen bulbs. The electronic circuitry of the DMS dimmers is well protected with features such as No-load, short circuit, overload and overheat protection. 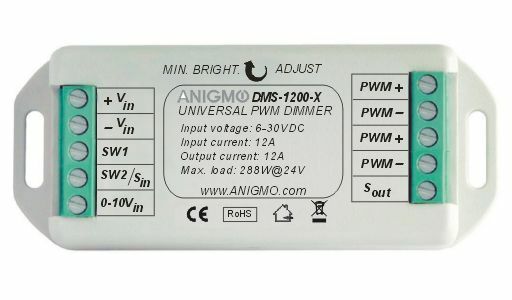 These protective features makes Anigmo PWM LED dimmer especially suitable anytime LED fixtures are installed on expensive boats, yachts, RV's and other luxury locations where malfunction could cause costly damages or even destroy the installation. With advanced protective features built into our PWM LED dimmer, such malfunctions are virtually impossible. As an added bonus, automatic recovery features provide smooth and maintenance free operation. The standby consumption of the unit is only 7mA.